While Wesley was at college, he investigated these issues through avid reading of spiritual writers—early monastics, Roman Catholic mystics, Pietists, Puritans, and Anglican “holy living” divines. While united in encouraging the pursuit of holiness, these writers differed on whether true holiness could be expected in this life. Consequently they offered two very different conceptions of perfection: dynamic, ever-increasing maturity; or static, unsurpassable attainment. Wesley’s early writings reflect the tension between these two ideas. He championed pursuit of holiness through spiritual disciplines, typically describing the Christian’s goal as “perfect love.” Simultaneously, he issued denials of any “perfect” holiness in this life. Wesley’s early writings also reveal that his aspirations toward holiness (sanctification) were driven by a desire for assurance that he was in a state of divine acceptance (justification). Then his Aldersgate experience convinced him that justification precedes and empowers sanctification, rather than being based upon it. Yet he was initially led to expect (and to proclaim) that justifying faith would bring instantaneous moral perfection! He soon came to question this expectation, and in 1741 he published a sermon, “Christian Perfection,” to answer criticisms of his initial claims. He hoped to sort out the ambiguity by defining both the limits and the possibilities of human perfection on earth. Wesley had to fight on two fronts when clarifying his understanding of Christian perfection. His opponents included other Anglican clergy and Jonathan Edwards. Most Anglican clergy equated holiness with proper actions and assumed that rational conviction of the rightness of an action regularly induced that action. In other words, if people know what is right, they will do it. Wesley’s spiritual journey undercut these assumptions and drew him instead to an “affectional” model of the Christian life. He insisted that our actions are not products of isolated decisions but flow from our inner affections, meaning desires or dispositions. As such, we can only hope for consistent outward holiness in actions if we possess the inward holiness of Christlike affections. Edwards, too, promoted an affectional model of Christian life, but he disagreed with Wesley on how we obtain Christlike affections. Edwards believed that these affections were unilaterally infused by God and, apparently, instantaneously complete. Wesley, believing that God’s grace works cooperantly in salvation, argued that the affections arise in response to God’s empowering impact on our lives. These affections strengthen into enduring “tempers” as we exercise them or fade away as we resist them. Wesley’s developed notion of Christian perfection can be summarized by saying that he believed God’s loving grace can transform our lives to the point where our love for God and others becomes a “natural” response. But how soon should we hope to reach this dynamic level of maturity? This became one of the hottest debates in Wesleyan circles. Prior to Aldersgate Wesley had stressed aspiring for holiness, whether it come before death or not. After Aldersgate, as his appreciation of God’s grace deepened, Wesley became convinced that holiness could be attained during this life. Even so, during the first two decades of the Methodist revival, he placed primary emphasis on “pressing toward the goal” by responsible participation in the means of grace. Only toward the end of that second decade did he begin to put emphasis on seeking Christian perfection now. It is possible that a surge in apocalyptic expectation in the latter half of the 1750s played a role in this change—heightening concern to attain Christian perfection before Christ’s return. 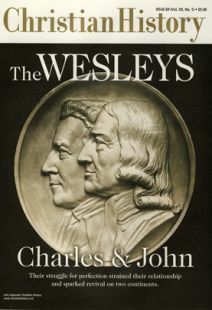 But Wesley also came to wonder around 1760 if he had been operating with a standard for Christian perfection that was so exacting it hindered people from experiencing its freedom. To counteract this possibility, he began emphasizing the limits of the deliverance from sin that comes with Christian perfection. With this more modest goal in mind, he encouraged people to seek rapid deliverance. Wesley also knew by the early 1760s that increased stress on present attainment of Christian perfection had increased the possibility of abuse. The London society led by Thomas Maxfield and George Bell proved this disturbing reality. Maxfield and Bell proclaimed a perfection that was instantaneously attained by the simple affirmation “I believe,” forfeiting any role for responsible growth prior to this event. And they portrayed this perfection as “angelic” or absolute, such that there was no need for growth after the event, or for the continuing atoning work of Christ. Not all of Wesley’s associates were convinced that he found the proper equilibrium. The most significant dissenter was his brother Charles. Charles refused to adopt the modified assumptions about entire sanctification that had made it possible for John to stress its present attainment. Indeed, in reaction to John’s modifications and the subsequent perfectionist controversy, Charles moved toward a more exacting expectation of Christian perfection. Charles remained profoundly aware of imperfection. He became convinced that perfection could be attained only at death. Randy L. Maddox is Paul T. Walls Professor of Wesleyan Theology at Seattle Pacific University.